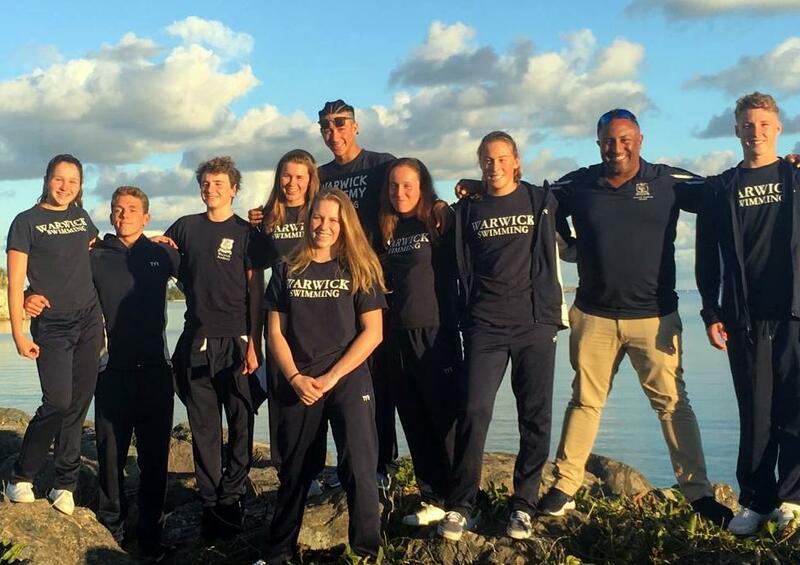 Members of Harbor Swim Club and Warwick Academy Students continued competing in the Mallards Winter Long Course Invitational at the Markham Pan Am Center in Canada, between the two teams Bermuda would capture 9 Medals on Day Two. Warwick Academy’s Skyler Powell won the Girls 15 & Over 400 LC Meter Individual Medley Silver Medal with a time of 5:32.76. Harbor Swim Club dominated the 13-14 Girls 50 LC Meter Breaststroke, Duerden clocked the fastest time of 36.10 to win the Gold Medal, while Myeisha Sharrieff finished claimed the Silver Medal clocking 39.33. Warwick Academy students picked up a Silver and Bronze Medal in the Girls 15 & Over 200 LC Meter Freestyle, Watson Brown finished second with a time of 2:11.81, while Powell finished third clocking 2:18.96. Warwick Academy would capture the Gold and Bronze Medals in the Boys 15 & Over 200 LC Meter Freestyle, Desmond won the Gold Medal clocking a time of 2:01.52, while Harvey was clocked at 2:07.15 to finish 3rd. The Warwick Academy team of Horan, Pitman, Powell and Watson-Brown won the Gold Medal during the Girls 15 & Over 200 LC Meter Freestyle Relay clocking a time of 1:53.93, while the Warwick Academy Boys 15 & Over 200 LC Meter Freestyle Relay team of Desmond, Wakely, Harvey and Ingham would win the Bronze Medal when they was clocked at 1:45.82. Taylor White from Warwick Academy finished 6th competing in the 13-14 Girls 100 LC Meter Backstroke Preliminaries touching he wall in a time of 1:11.70, while her schoolmate Logan Watson-Brown finished 4th in the Girls 15 & Over 100 LC Meter Backstroke Preliminaries clocking 1:08.98. Gabriela Pitman also representing Warwick Academy finished 17th touching the wall in a time of 1:18.48. Warwick Academy student Jack Harvey finished 8th during the Boys 15 & Over 100 LC Meter Backstroke Preliminaries when he was clocked at 1:04.67. During the 13-14 Girls 50 LC Meter Freestyle Preliminaries Harbor Swim Club’s Emma Kittleson finished 6th with a time of 29.24, her teammates Josephine Duerden and Lindsay Scherer finished T13th both recorded times of 29.83. Warwick Academy’s Taylor Horan finished 18th with a time of 30.03, while her schoolmate Taylor White finished 20th with a time of 30.22. The Girls 15 & Over 50 LC Meter Freestyle Preliminaries saw three Warwick Academy students finish in the top 8, as Watson-Brown had the fastest time of 27.33, Pitman was 6th clocking 28.71 and Powell finished 8th with a time of 29.23. Four Warwick Academy students competed in the Boys 15 & Over 50 LC Meter Freestyle Preliminaries, Caleb Ingham finished 3rd with a time of 25.26, Brian Desmond finished 9th clocking 26.13, Zebedee Wakely clocked a time of 26.91 to finish 12th and Harvey finished 16th with a time of 27.21. White from Warwick Academy finished 5th competing in the 13-14 Girls 100 LC Meter Butterfly Preliminaries with a time of 1:10.72, while her schoolmate Wakely finished 5th competing in the Boys 15 & Over 100 LC Meter Butterfly clocking a time of 1:01.10. White finished 5th representing Warwick Academy in the 13-14 Girls 200 LC Meter Freestyle clocking a time of 2:20.22, Sharrieff from Harbor Swim Club finished 12th clocking 2:28.77, while Warwick Academy’s Tayla Horan finished 15th with a time of 2:29.92. Harbor Swim Club’s Lindsay Scherer was 20th with a time of 2:35.05 and her teammate Kittleson was 38th clocking 2:45.75. Warwick Academy’s Pitman finished the Girls 15 & Over 200 LC Meter Freestyle in 4th place with a time of 2:20.73, her schoolmate Caleb Ingham finished 19th competing in the Boys 15 & Over 200 LC Meter Freestyle.